Are you looking for epoxy flooring? Then you’ve come to the right place. WHAT IS EPOXY FLOORING AND WHAT CAN IT OFFER YOU? Epoxy flooring, what is it and how has it become one of the most popular flooring options across the country? Well, an epoxy coating is made up of resin and hardeners that cure with a porous concrete surface when applied. After the application has been completed your floors become much more durable, resistant, and longer lasting. 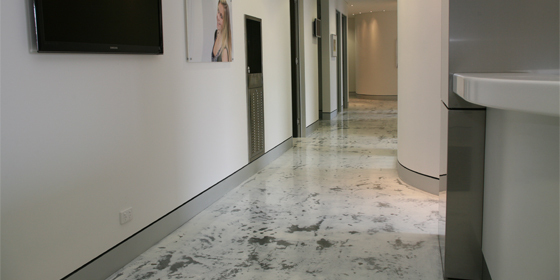 An epoxy floor is also beautiful, it can mimic other flooring systems and be designed like no other floor. The unique abilities of texture, pattern, and design are incredibly unique to epoxy floors. After the mixture has chemically cured with your concrete foot-traffic, water, chemical break down, oils, stains, abrasions, and impact will no longer be an issue. Epoxy coating is the strongest layer of flooring you can install between the outside world and your concrete floors. These floors create a surface like no other starting from their protective and resilient qualities to the fact that they can be beautiful masterpieces. If you have vehicles or machinery in your garage you want epoxy flooring. If you use your garage regularly and would prefer the concrete not to wear and crack easily then an epoxy floor is for you. 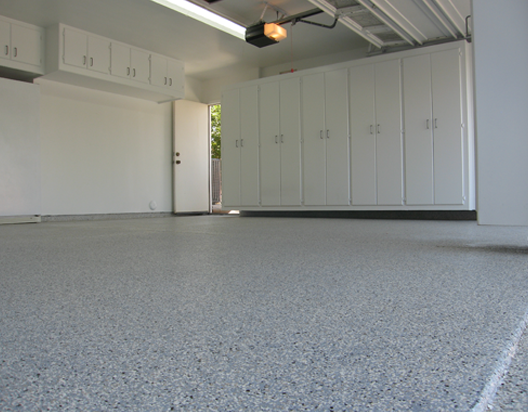 With a garage epoxy floor, you create a safer environment for yourself and everyone who steps into your garage. These floors have high levels of non-slip qualities that cannot be mimicked by other flooring options and they can be installed to resist fires. When some of the epoxy pigment is exposed to heat it will create a barrier between itself and the fire, this will cause the fire to burn itself out. The best part? These qualities do not limit your choices in design, color, textures, or patterns. 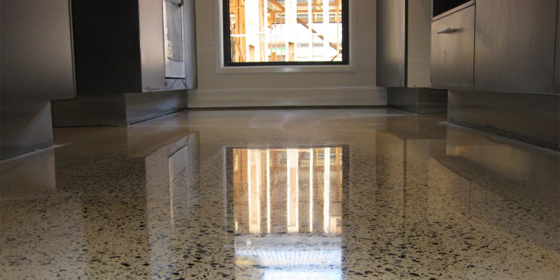 All epoxy floors can be beautifully installed and protect you and your friends/family. Your epoxy garage floor can withstand anything life has to throw on it. It won’t absorb grease, oil, car fluids, or chemicals that would typically damage other floors. The epoxy coating does not allow your concrete to absorb the harmful chemicals that would otherwise cause the surface to break down. Spills are kept on the surface; this makes them easily cleanable without ruining your floors. When an epoxy floor is professionally installed the limits are truly endless. Epoxy flooring has made the jump from once only being considered as flooring for facility areas to interior designs for homes. These floors have become the most popular flooring options for homes across the country. Residential epoxy floors are being used in home kitchens, living spaces, extra rooms, and so much more. A residential concrete epoxy floor can be installed to mimic other floors like tile, but it will never require the level of maintenance other floors would need. This makes an epoxy residential floor quick, affordable, and extremely high performing. 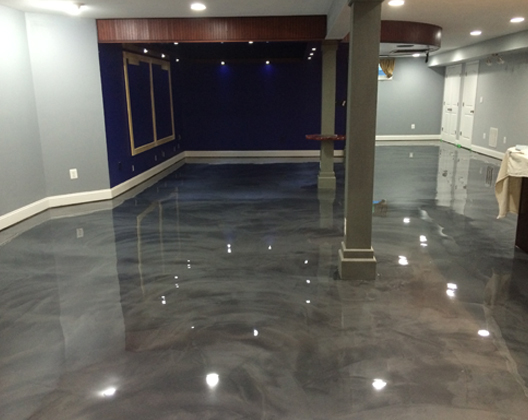 Epoxy basement floors are some of the most popular areas to have epoxy installed because of their resistant qualities. A basement epoxy floor will never be susceptible to water-damage because the coating protects your concrete from the top and bottom from moisture. If moisture were allowed to penetrate your floor, it would create a perfect breeding ground for mold, mildew, and harmful bacteria. Epoxy floors used in homes last longer and resist more of life’s ever-changing days. For an affordable price, consider the design possibilities and easy maintenance options when deciding on your floors. Need more guidance? Give us a call today! For a commercial setting, like retail, drawing your customers in by any means possible can also mean using your floors. Epoxy commercial floors can be installed with different designs, logos, textures, and colors, this quality can help turn a dull and boring floor in your business into a bold and attractive work of art. Commercial epoxy floors are resistant to wear and tear, meaning, any levels of high foot-traffic will not cause one area or the floor as a whole to dull or crack over time. The concrete is safe under the epoxy coating barrier. Safety is another large concern for many business owners, and we are thrilled to say our commercial epoxy floors can be installed with safety features to ease your mind. With an epoxy commercial floor, you do not need to worry about slip and falls because epoxy floors can be installed with slip-resistant features that keep you, your staff, and your customers safe at all times. A professionally installed commercial epoxy floor brings elegance and grace into an area while also being strong and resistant. WHAT INDUSTRIES ACTUALLY USE EPOXY FLOORING? With decades of combined experience, our team has serviced many different industries with different needs that have all found epoxy to be the best decision. Epoxy coatings are the most versatile and worthwhile options for businesses that have nothing in common except their floors. With moisture-resistant qualities, many areas and facilities that need to adhere to health codes, epoxy floors help meet those standards easily. For floors that require seamless surfaces for their machinery, epoxy floors provide that. For some areas that require heat resistant qualities, epoxy can help with that. The versatility of an epoxy industrial floor is unfathomable, so where do industrial and commercial settings use epoxy flooring. WHAT KIND OF DESIGNS ARE ONE OF A KIND FOR EPOXY? Metallic epoxy floors are true masterpieces that can never be duplicated. Not only are these floors only limited to the realm of epoxy, but metallic epoxy also can never be duplicated by the same contractor on two different projects. Sure, we can help keep the color schemes similar, but the job itself will never look identical to another one. This is one of the most popular details of metallic epoxy floors. People truly have a work of art that is unique to only them. Metallic epoxy floors create 3D illusions like clouds, craters, and other dimensions by special pigmentation. A metallic epoxy floor is the hardest and most resistant option you can choose because it is made of 100% epoxy. If you’re looking for a uniquely beautiful design, metallic epoxy floors can do just that. It is crucial to have a professional install your floors because improper installation of a metallic epoxy project can damage your concrete floors.